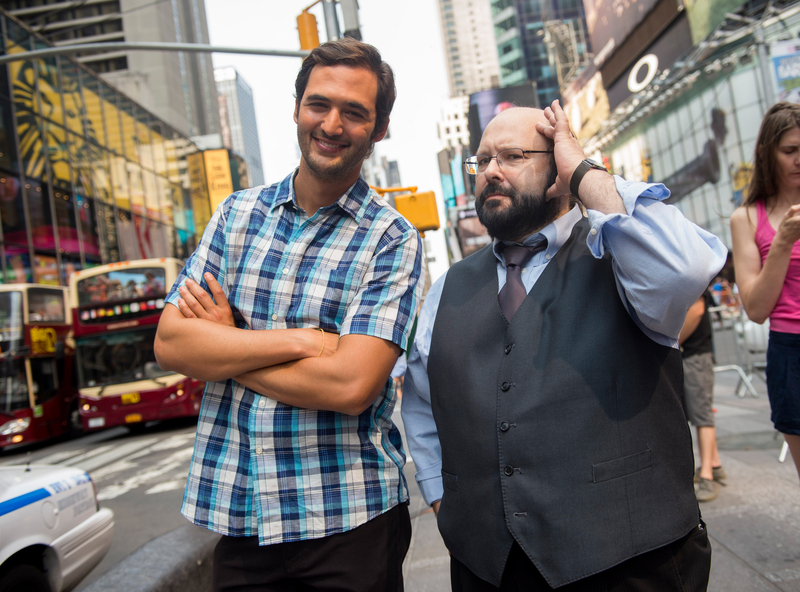 NEW YORK CITY, N.Y.- Jason Silva with Marc Salem in Times Square. When it comes to our personal experience of the world around us, perception is everything. How we perceive our environment is largely influenced by the information our brains receive from our senses, which help us to determined how to behave and what to feel in a given situation. Every day, we rely on the five most recognizable senses of sight, sound, smell, taste and touch. However, our brains also regularly perceive other sensations, from temperature (or thermoception) and pain (nociception) to the passage of time (chronoception) and the awareness of our body’s movement and orientation in space (proprioception). By honing our so-called “Super Senses,” we can learn how to better embody our bodies, thus improving our experience of life. But is it also possible to perfect our cognitive perception of our senses to the degree that we develop the superpowers to predict how our bodies will behave in a given situation or to even read minds? 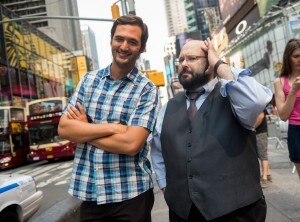 The next mind-bending episode of National Geographic Channel’s Brain Games with Jason Silva explores such fascinating questions against the backdrop of New York City, the nation’s center of sensory overload. Our senses are both incredibly sensitive and awesomely powerful. They can be tricked by unexpected sounds or tactile sensations and confused by illness, injury or the passage of time. Yet, our senses also have great potential to be retrained, improved, and even mastered, which Brain Games reveals to us in a variety of awe-inspiring ways. 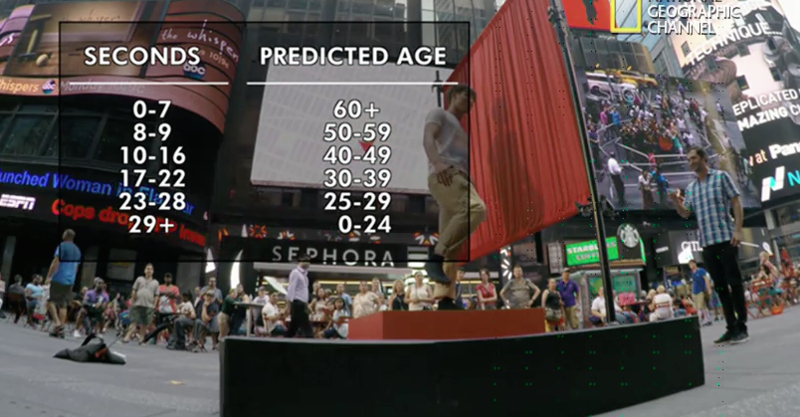 The first Super Sense tested on the show is the sense of balance, By measuring the length of time volunteers were able to stand on one foot with their eyes closed, host Jason Silva was able to accurately predict their appropriate age ranges. In turns out that the older a person is, the more difficult it tends to be for him or her to stay stable and upright while balancing on one leg, especially with one’s eyes closed. Balance tends to worsen as we age because the three senses that provide input for maintaining our equilibrioception—sight, vestibular sense and proprioception—also age. The vestibular system, located within each ear, provides sensory information about motion, equilibrium and spatial orientation. This system takes cues from different parts of the inner ear that sense linear acceleration and rotational movement. As we grow older, there tends to be a loss of cells in the inner ear, as well as a reduction of proprioceptors in the skeletal muscles and joints due to rheumatic conditions, like arthritis, which decrease the reliability of sensory input from the joints and muscles. The less we can count on our senses for reliable input, the more difficult it is to maintain balance. It turns out that I have less than reliable input from my senses for a woman in her 30s. 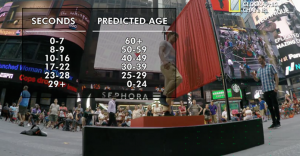 I’m embarrassed to admit that Jason Silva would have gauged my age to be between 55 and 65 based on the paltry length of time I was able to balance with one leg raised! How could this be? One reason for this abnormal result might be due to limitations in proprioception, or my ability to sense the relative position of different parts of my body in space. I was born with strabismus with amblyopia, or “lazy eye,” a condition where the brain does not fully process the visual signals sent by the affected eye. Those of us with ambylopia also have limited depth perception, which means we not only struggle to assess the distance between the self and another person or object, but we also have difficulty assessing the spatial orientation of our own different body parts. Needless to say, consistent eye-hand and eye-foot coordination has not been my strongest suit throughout my life. My balance has also been more impaired in the last several years since I developed the neuromuscular disorder, dystonia. In movement disorders, like dystonia and Parkinson’s, there are abnormalities in the basal ganglia—which initiates and regulates movement—and in the production of the neurotransmitter dopamine, a chemical released by the brain that is involved in the efficiency of basal ganglia function. Dopamine not only plays a role in movement, but in pain processing as well. Deficient levels of dopamine can make movements delayed and uncoordinated, as well as increase the sensation of pain. Millions of Americans are all too familiar with the super sense of pain, or nociception, The phenomenon of chronic pain can produce a number of chemical, structural and functional changes in the brain, altering how it process and modulates. The brain begins to produce abnormal levels of numerous neurotransmitters, which relay signals between nerve cells (or neurons), communicating information through the brain and body. Chronic pain can also affect the super sense, proprioception. A post by Embody Pilates suggests that proprioception and pain cannot simultaneous coexist, which means that a person in pain has less body awareness and is more prone to falling over. The good news is balance, like proprioception, can be retrained, improved and maintained through practice, practice, practice. Repeated focus and attention on maintaining proper alignment in yoga balancing poses in has definitely improved my ability to stand on one foot and to decrease my proclivity for falls in general. In fact, when I retried the Brain Games test in my favorite balance pose, Dancer’s Pose, I was able to double the time standing on one foot, placing my age estimate in the 40s, not so far from my actual age of 38. Interestingly, when I repeated the test with my eyes open, I had balance of someone under age 25. It turns out that visual cues give us a great deal of information about where we are in space, signaling our brain to instruct the joints and muscles where and how to move. Performing properly aligned yoga poses with conscious presence also provides key sensory feedback to build better awareness of where and how our body is positioned, both in static poses and controlled movement flows. We’ve all heard the saying: “You can’t teach an old dog new tricks.” However, research from the last several decades of neuroscience reveals that the brain has neuroplasticity, meaning that our brains maintain the ability to develop and grow throughout the lifespan. The brain can form new neural connections and to remap sensory pathways even as we age. We know that there are many ways we can keep mentally sharp as we age, from eating nutrient-rich foods and exercising to continually teaching the brain new things, like learning a new language or performing mind puzzles, like those in Brain Games. 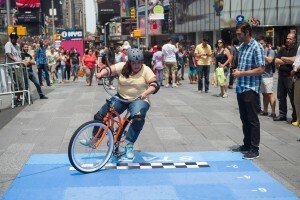 NEW YORK CITY, N.Y.- Jason Silva with volunteers and the Backwards Bike in front of a crowd in Times Square. Those things we learn how to do in life that become second nature, which seem simple to pick back up wherever we last left off because we’ve done it so many times before, are said to be “as easy as riding a bicycle.” Brain Games challenges this saying with a fun experiment that hacks a bike by reversing its steering. The results are enlightening, offering what Murray calls an incredible example of neuroplasticity by reprogramming the part of the brain that learned how to ride a bike many years ago as a child. You’ll definitely want to watch the show to see how this played out. This also helps to better understand how changes to the brain and spinal chord caused by chronic pain alter how we perceive nociception. Sensory signals can get crossed and “misread” normally harmless stimulus, such as a light touch of the skin, as excruciating pain. Yet in some cases, we can use tactile stimuli to “unscramble” crossed sensory signals. For example, employing the sensory trick of touching a body part adjacent to the site of abnormal contractions and movements of dystonia can help reduce the muscle contortions of dystonia. 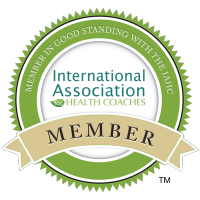 Our growing understanding of the impressive malleability and power of the brain—especially as it pertains to movement, mindfulness, and sensation—is also transforming the way we view our capacity to recover from injury and illness. Studies have shown that mindfulness meditation and yoga, for example, can stimulate an increase in grey matter density in the hippocampus to combat the loss of gray matter caused by chronic pain. Yoga, as well as other types of exercise, can also trigger endorphins, which can reduce the perception of pain. 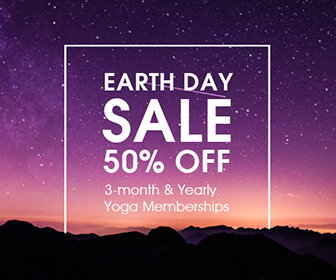 Exercise has also been found to help brain cells use dopamine more efficiently, while Yoga Nidra meditation can increase dopamine release and blood flow to the subcortical regions of the brain. Research suggests that meditation might also have the capacity to slow or reduce the brain degeneration in the hippocampus that leads to Alzheimer’s and to bring greater neural connectivity to the default mode network part of the brain . One study even offers hope that yoga and meditation might be able to reverse memory loss associated with Alzheimer’s and to improve cognition. While these findings lack visual pizzazz, their implications are just as powerful as the “predictive” prowess of the mentalist Marc Salem, featured in Brain Games. Can he really read the minds of audience members or is does his true talent lie in having incredible observation skills and an extremely reliable memory? My vote is with the latter, which is just as remarkable. The extreme dancers of Brooklyn’s Streb Lab, who have mastered the interconnected “super sensory arts,” will further amaze you with their superhuman ability to seemingly predict human movement. Their ability to anticipate each other’s movements in high-pressure, tightly controlled scenarios is living proof that honing our Super Senses can have near-miraculous implications. Silva concludes, “We can absolutely listen and pay better attention to signals we get from our own brain.” And by doing so, we can hone our senses, refine our perceptions, and improve our own physical, emotional and mental wellbeing, becoming the superheroes of our own lives. Learn how to hone YOUR senses by watching Brain Games: Super Senses, which premieres Sunday, March 13, at 9/8c on National Geographic Channel.